Our hearts go out to the little girl that lost her life this weekend when she was attacked by a dog. Our thoughts are with her family and friends. This is a tragedy of epic proportions and one that NO family should ever have to endure.This should never have happened. When the news reports stories about a horrible DOG attack, an attack that kills an innocent child, they should really stop emphasizing that it’s a PIT BULL and start taking a hard look at how that dog was raised. Here’s a picture that most news reports did not show. This is the “family pet” they speak of. The “family pet,” that out of no where killed that poor girl. The “family pet” that’s wearing a *weighted collar* around his neck (used to build muscle and strength in a dog during exercise.) Seriously, how many average families put those on their dogs? This is the “family pet” that was encouraged to latch onto objects and hold. This “family pet” was TRAINED to be dangerous. This dog is not a “family pet.” This dog is a product of his environment. He was turned into a weapon. The OWNER is to blame for what he created. He should go to jail for setting this stage, and then leaving his dog unattended while he wasn’t home. 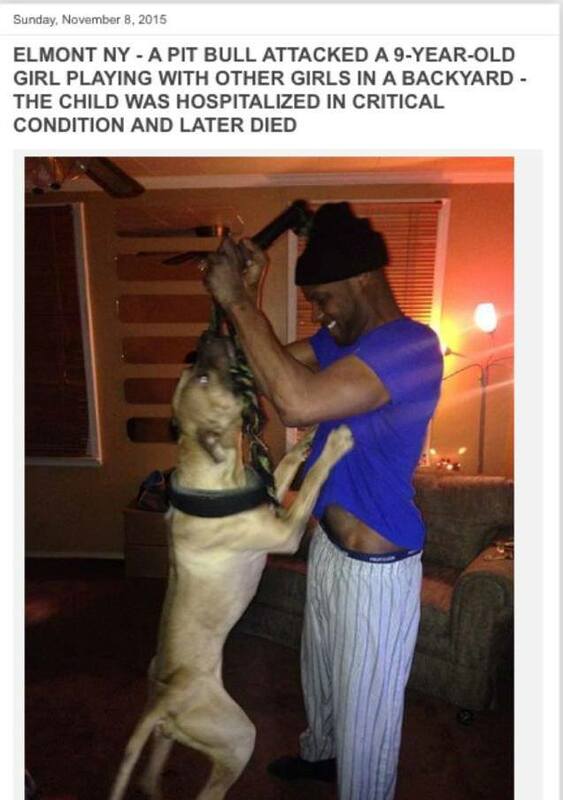 Please… do not blame all PIT BULLS for what this dog was taught. This is a tragic story and we feel horrible for that little girl and her family, but demonize the man, not the animal he created. Yes, some dogs (of every breed and size) are not nice, but the same goes for people. We are tired of bad dog owners raising pit bulls to be dangerous. Again, any dog, big or small can be born with aggression issues. Any dog, big or small, can be trained to act aggressively with people. That is NOT a common pit bull trait. Not all pit bulls are aggressive and dangerous. You only hear the horror stories, and as this story shows, the owner is often responsible for creating the situation. For every “pit bull” attack reported in the news, we can show you countless POSITIVE pittie stories too. Remember that, before you judge the entire breed. Again, our hearts go out to that little girl. She deserved better. Pledging $3 by my human, Brenda Williamson, for fabulous BEGINNER sweetie EMMY. Hope he gets the love & petting he wants in a kind home! « Previous: Urgent’s 3rd Annual “GoWalk Your Dog” is Coming Soon!